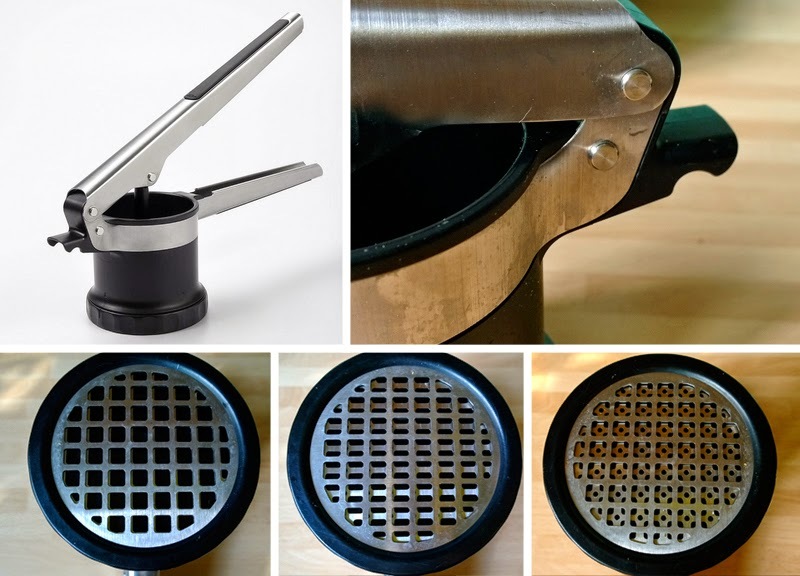 I've been pondering the ricer but they have always looked so bulky and I'm typically not a fan of of one-use kitchen gadgets as such, so the title of the OXO Good Grips 3-in-1 ricer caught my attention. Multi-tasking innit? I've been using this for a few weeks now and it's a great tool. And it totally makes sense. Why would you want a consistent size ricer for all recipes? This puppy can mash, puree, squeeze spinach and grated potato for rosti or hash browns and even pulps tinned tomatoes. (I'm suspicious about pre-chopped tinned tomatoes and always crush whole tinned tomatoes myself.) In fact, I'm gutted I didn't have this for Baby Foodie's weaning stage which would have been so useful. As you know I love the OXO brand. Design and function in perfect harmony. Being a detail freak I get a bit excited when I see things like the little ridge to grip onto a pot edge or the carefully chosen shape of the ricer holes so they rotate for fine, medium and course usage. Also, it's easy to wash which is another of my demands for kitchen tools. The build is, as to be expected, great quality. I've got OXO products that are almost a decade old now. This ricer is heavy (in a good way) and will be in my kitchen for years. Needless to say, my collection of crap mashers are binned. This is a light little recipe that I've come up with which is perfect for spring. You shouldn't be scared of making gnocchi, but there are a few rules that you need to stick to to keep them light and airy as explained in the recipe. No one want to eat chewy bullets now do they? Mix a generous squeeze of lemon juice and freshly ground black pepper with the cheese. Place into a piping bag with a large nozzle, or a plastic bag with the end cut off. Boil the potatoes, whole and skin on until they are just tender. Do not over cook them. Drain and allow to steam dry for a few moments. Carefully peel whilst still hot, using a clean kitchen cloth to protect your hands. Mash the potatoes (ideally using a ricer) whilst they are still hot (very important). Stir in the beetroot puree, flour, beaten egg, a generous pinch of salt and the food colouring (if using) and when it is just cool enough to handle, knead to a soft dough. The dough must be right, so be careful with the flour, adding it cautiously at first and not being afraid of adding a little more. If there is too much flour they will be hard like bullets and if they are too soft they will fall apart in cooking. The dough should be soft, but formed enough to handle. Dust the worktop with a little more flour and roll the dough into long sausages about 1.5cm thick then cut into pieces about 1.5cm wide. 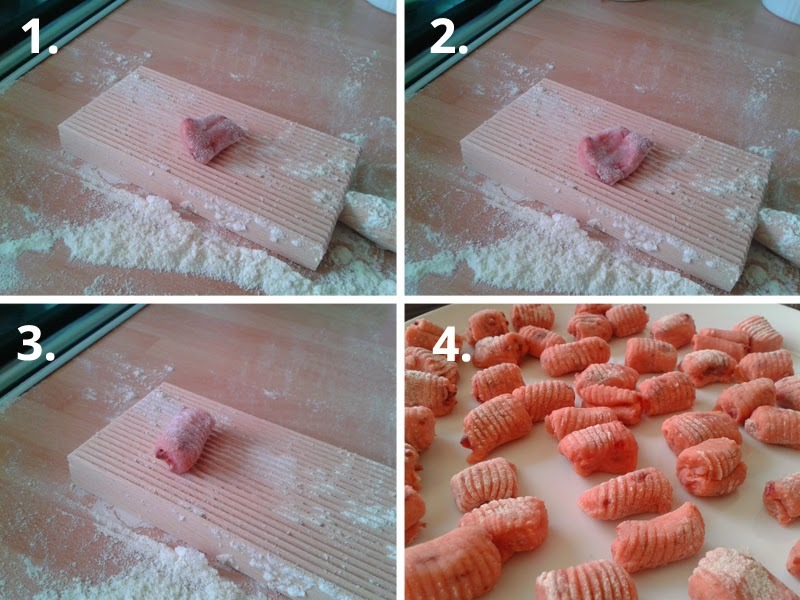 Press them gently in the middle to form a little scoop or you could roll them across a fork or gnocchi board. To use a gnocchi board, press the cut piece into the floured board, then roll over, tucking the edges under the ridged surface. Place on a plate and as soon as you have finished them, drop them into a pan of boiling water with a pinch of salt. They should float to the surface after just a few minutes when you should remove them with a slotted spoon. Best to do them in batches if you are doing a lot, keeping the cooked ones in a warm oven. 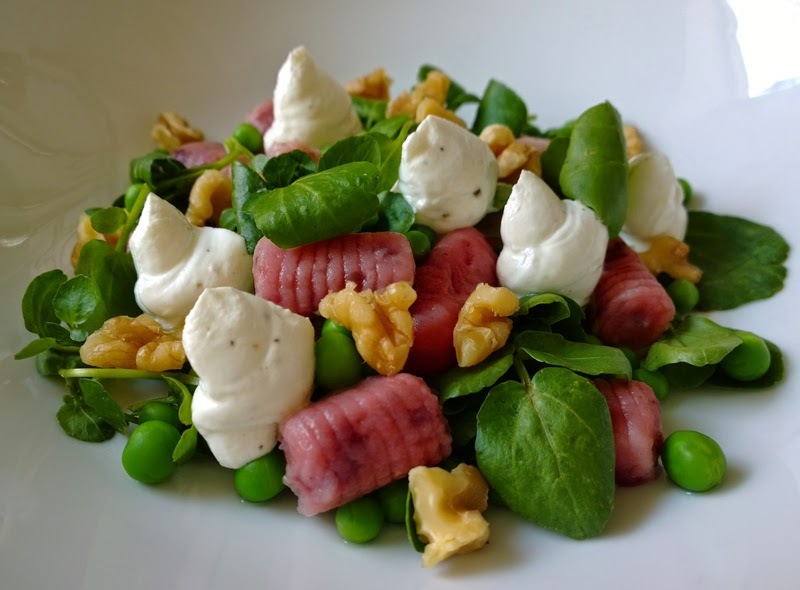 Arrange the gnocchi with the peas and watercress on plates. Drizzle with olive oil. Pipe the goat cheese then sprinkle with the walnuts. Main recipe image taken with the Nokia 1020. I was sent the OXO ricer for review.